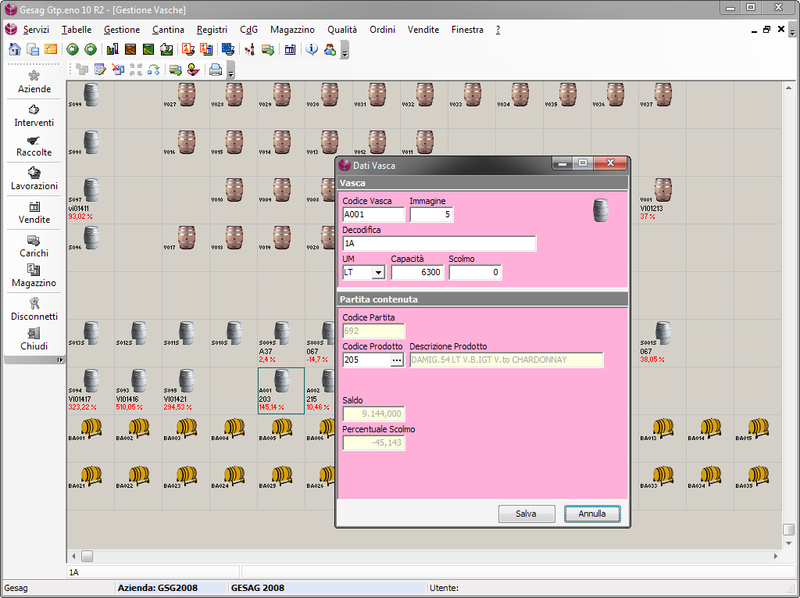 Wine production with a modern and complete management system. Gtp.eno is the Gesag management software solution thought for wineries, vineyards and wine shops. Vinification, bottling, marketing, product quality, sales and shipping: Gtp.eno allows to manage all this and much more! All aspects of the wine production process will be easily but efficiently managed and analysed, also in accordance with the regulations in force imposed by national and regional authorities. 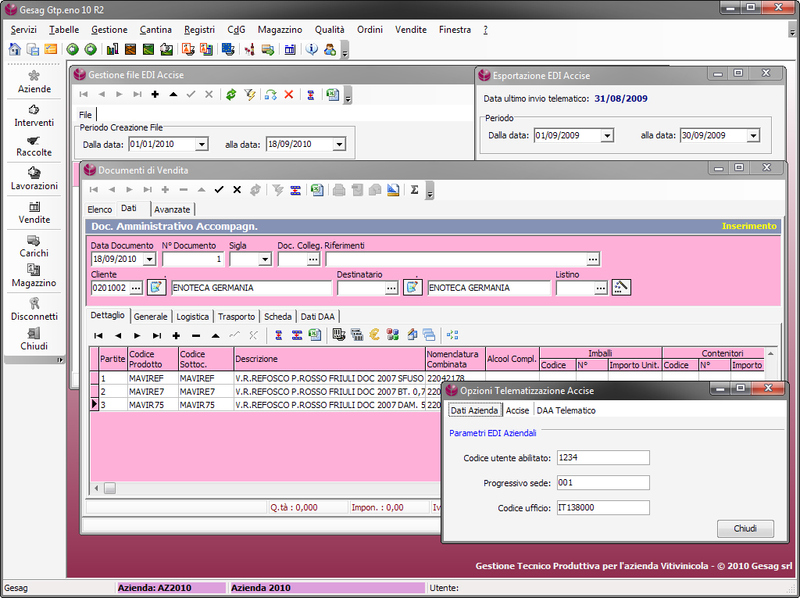 GTP.Eno, wine production with a modern and complete management system. Gtp.eno is the Gesag management software solution thought for wineries, vineyards and wine shops. Gtp.eno tracks the whole process, controlling the production from the vineyard to the bottle (traceability). 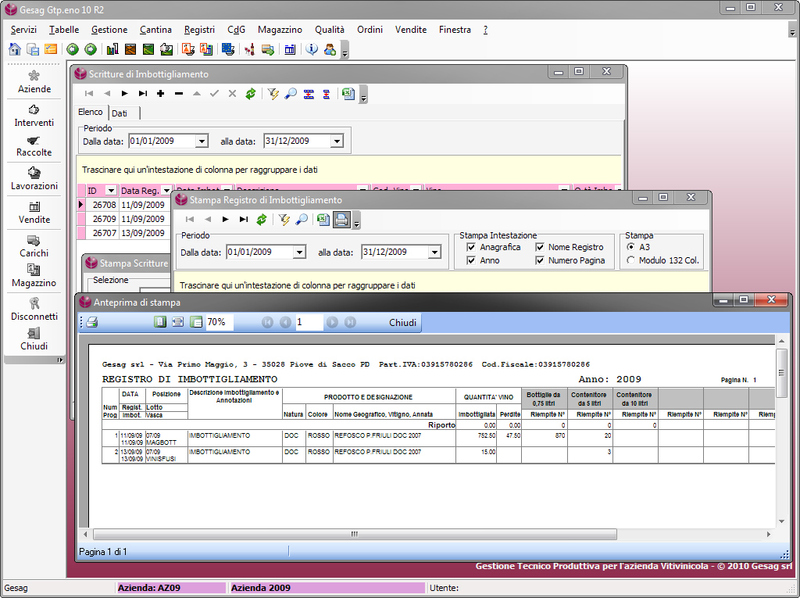 Gtp.eno is the essential tool for the winemaker who wants to easily manage the winemaking process, store and manage chemical analysis and control production costs, in accordance with the regulations in force. All these functions have been grouped into integrated but independent modules. In this way software administrators can decide how to use the product and are allowed to enable all the analysis and control functions with a single software registration. It covers the most important aspects of the wine cellar management and regulation, like winemaking, bottling and marketing; it is possible to generate the required marketing reports and provide important information on the different processes, the movement of products and the management of the tanks involved throughout the production cycle. In addition, the most significant data are processed for drawing up wine declarations. All data entered is immediately available to other modules. 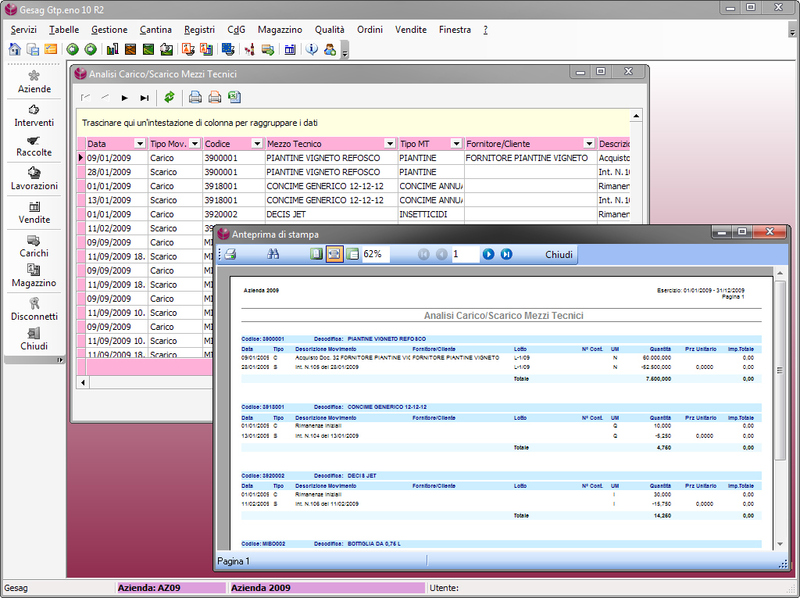 It allows the preparation and printing of customer orders, sales documents and invoices. 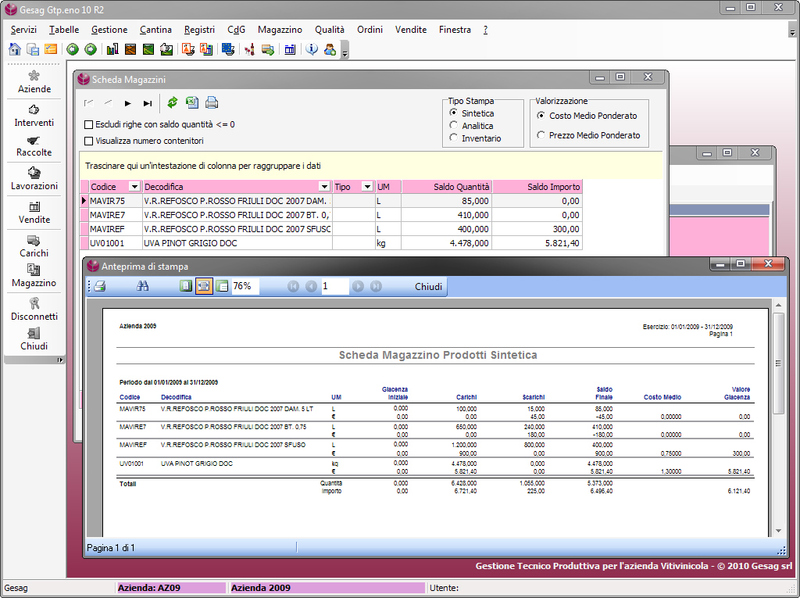 Multiple price lists can be associated to a single product, granting a quick and easy price assignment and immediate integration with other activities of the sales systems. 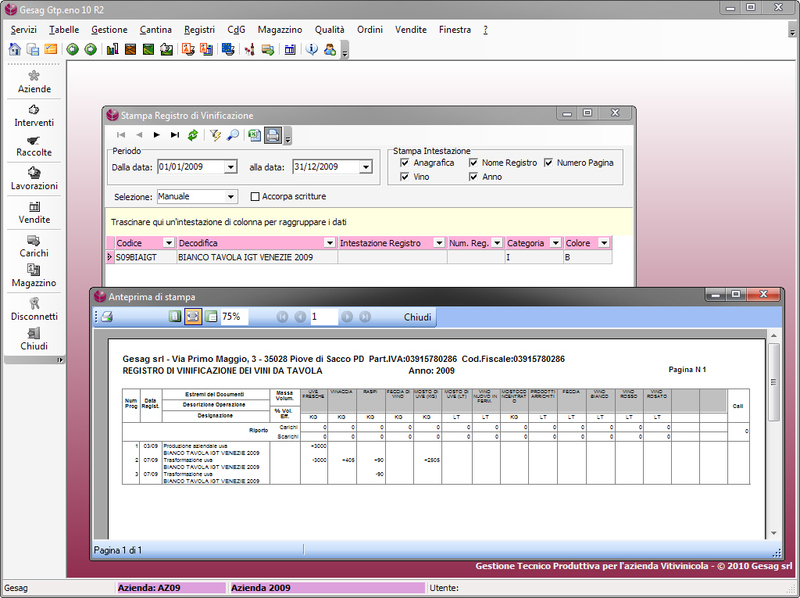 Other useful functions allow to perform main accounting activities. Moreover, the module comes with preconfigured sales documents that you can use as-is or as a referencing template to create your own customized document types. It allows you to manage in a simple and efficient way the warehouse technical equipment, raw materials and products: in any moment you will know exactly their quantity, their value, their movements in the warehouse and you will be able to analyse all warehouse data considering the aspects that are of most importance. 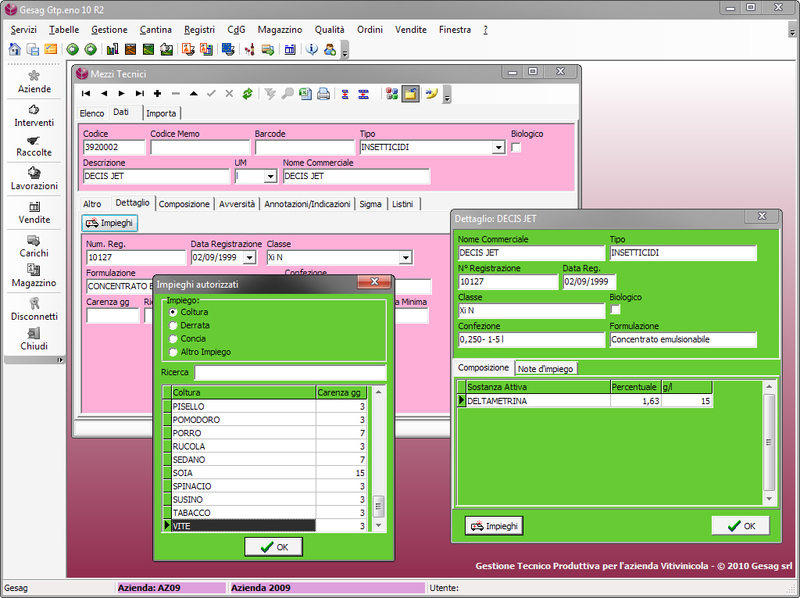 As Gtp.eno fully integrates with Gtp.CE and Gtp.TS, the whole data entry process can be even more automated using barcode labels. This module allows you to collect and manage data aimed at products and resources quality analysis throughout the different phases of the production cycle, both in the vineyard and in the winery. It also allows you to record and examine all operations that have an effect on the quality of the production, even taking into account technical and agricultural interventions on crops and plots. 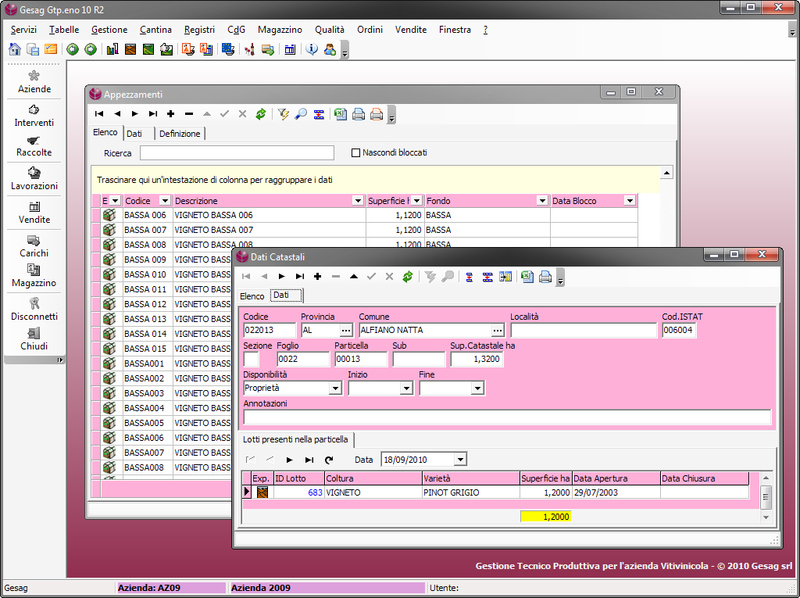 It consists of a group of functions developed to track the entire production process, including the technical information about resources used and obtained products: that means you can analyse every aspect of the production process, such as the origin of the supplied materials, the transaction duration and characteristics, the creation of the finished products or the sales and delivery scheduling. Even for this module you can print brief or detailed reports to base your management decisions on. From 1 May 2009 qualified operators (like professionals, financial representatives or anyone owning commercial warehouses containing alcoholic fermented beverages) are required by law to send in electronic format their accounting reports. It is a real revolution for the wine industry and, to deal with it, Gesag released a major upgrade of Gtp.eno. With this update users will be able to generate automatically the file starting from the movements already entered in the database and send it using the application at the Customs Agency website. A simple, intuitive and fast way to meet an urgent need using the same datasource and management system! From 1 January 2011 exclusively the DAA electronic submission will be possible. The exchange of information between seller and customer using the Customs electronic system concerns all data about shipping: not more than a week before the shipping data, sellers have necessarily to send the DAA. For this reason Gesag released a series of functions that allows you to automatically generate the files to be sent analyzing the sales documents already entered in Gtp.eno. Once again Gesag is on the cutting edge for providing customers with a simple management but at the same time complete tool in accordance with the latest regulations. Finally a software designed together with final users, easy to learn and intuitive to use! Software applications are often complicated and difficult to learn for those who are not familiar with computers, but Gtp.eno offers a simple and complete working tool, suitable for all kind of business, as it is based on experience, awareness and deep knowledge. 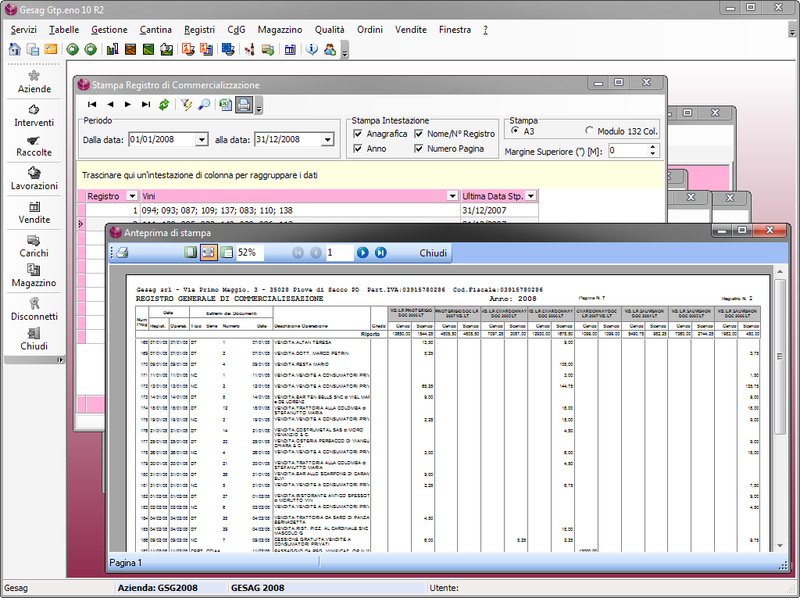 Gesag Gtp.eno can exchange data with Office applications, can be used by more than a client at the same time and integrated with other Gesag software solutions for advanced processing, statistics and analysis.